An often overlooked source for greater profitability is the lunch trade. Generally, in a full service restaurant, most of the costs associated with preparing for the evening trade is done during the day. You’re pay rent and various other bills regardless of whether you are generating sales or not. You have to pay staff to be in the restaurant to carry out the prep work required to ensure a successful evening shift. If you could cover the costs of the prep work labour during the day, you could be sitting on a profit goldmine for the evening trade. Who are your lunchtime customers? Are they business people who only have an hour for lunch which means you need to get them in and out as quickly as possible? Or, are they housewives/stay-at-home parents who are looking for a longer and more social dining experience? Or, are they students who don’t have much spend and are looking for a quick turnaround time on their order? You need to figure this out before you undertake any marketing – your marketing is meaningless if you do not know who you are marketing to. Speed – most employees only receive an hour for lunch which means you need to get those orders out fast. If your menu items usually take longer than 10 minutes then you should consider creating a special lunch menu built on speed. Pricing – the cost of living is always on the rise and the first place people will stop spending money is at restaurants. Your lunch offers and pricing needs to be enticing enough to attract customers but still high enough so you turn a profit. Diets & Allergies – dietary restrictions are extremely prevalent for most of the population today. The list of dietary restrictions is ever-growing, think back to when everyone considered “gluten-free” to simply be a fad. Know the difference between a dietary need and an allergy - label accordingly. One could make the customer sick while the other could kill them – be careful. 4. Portioning – smaller portions are a key factor in your lunch menu. Most customers are counting their calories and millennials are constantly changing their eating patterns from 3 to 5 to 6 meals a day which means they want smaller portions. Many customers who are looking for smaller portions won’t mention this, they’ll simply stop coming. Accessibility is paramount during lunchtime during the time crunch. Not everyone has more than an hour to wine and dine and your establishment needs to be accessible in addition to having a quick turnaround time on orders. 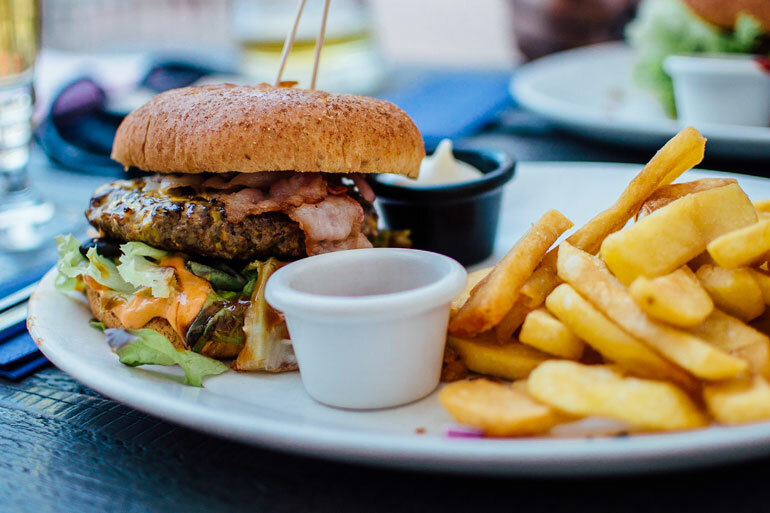 You could consider offering online ordering which will allow potential customers the convenience and speed of placing their order before they get to your restaurant. You could also offer delivery (in addition to the online ordering or on its own) which will allow the customer to call in or place their order online and wait for the delivery – this is a great way of filling virtual seats. You will need to consider how you will deliver food that is still presentable and, where applicable, hot! Delivery is a key component in creating accessibility during lunch but you must ensure you have right tools to execute it. The above steps are great ideas to improve your lunch time sales. The plan may sound easy but it is going to require your time and commitment as well as some financial resources. Have a meeting with your team to discuss the above points, create an action plan and assign a task to each person before putting your plan into action – don’t forget to review your plan regularly.